Beatrix Potter bought in the Lake District. Two versions of each Beatrix Potter character were made by Ty. The main difference between the two versions was the color of thread used to embroider the names on their clothing. There are other minor differences between the exclusive and retail versions. 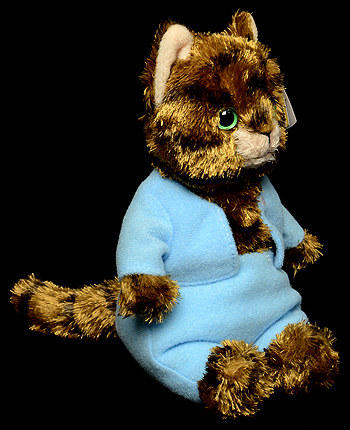 The versions embroidered with gold thread were sold exclusively by The World of Beatrix Potter Attraction, in Cumbria, and Harrods, UK. 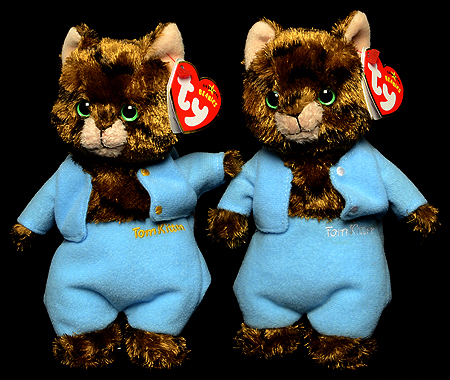 The versions embroidered with other colors of thread were sold by regular Ty retailers in the UK. 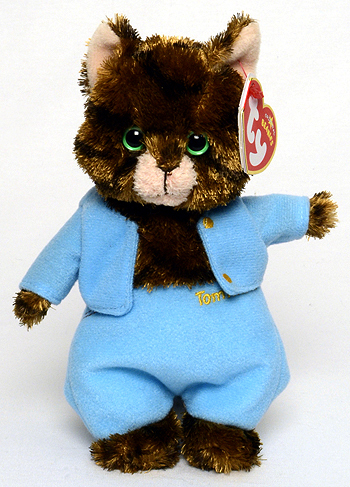 The color of thread used for the buttons on Tom Kitten's Jacket are different between the exclusive and retail versions. The buttons on the gold-thread version are gold. The buttons on the retail version are white. Ty made six Beatrix Potter story characters. They are Jemima Puddle-duck (style 46069), Mr. Jeremy Fisher (style 46066), Mr. Tod (style 46068), Peter Rabbit (style 46064), Pigling Bland (style 46067), and Tom Kitten (style 46065). Most collectors refer to the characters by their short names, but all of the swing and tush tags show a longer name that includes “The Tale of” in front of the character's name. 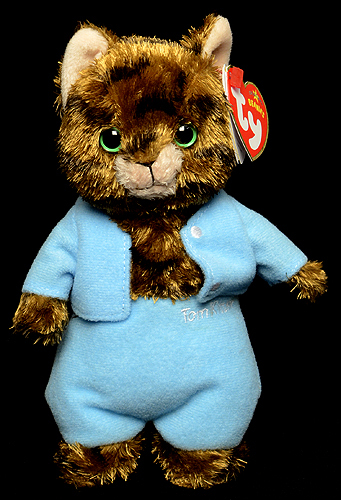 Beatrix Potter Beanie Baby group with gold thread lettering. 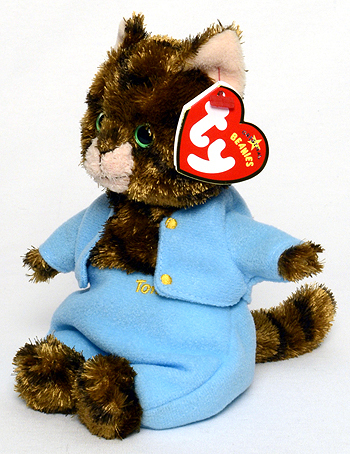 Beatrix Potter Beanie Baby group with non-gold thread lettering. The Tale of Tom Kitten - name embroidered with gold thread. 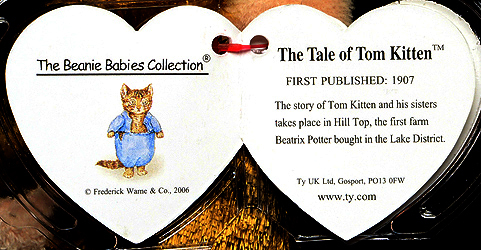 The Tale of Tom Kitten - name embroidered with white thread.